Most writers on design education are (rightly) scornful of our highly standardised school curriculum. We see it as focused on past knowledge, emphasising the academic over the creative and practical. Though it claims to be trying to fit children for adult life, it is not itself orientated towards the future or the skills and understandings that might help young people cope with a rapidly changing world. But are we actually so forward looking ourselves? As we consider the idea of ‘Design and/or Technology 2.0’, it might be an appropriate time to look at the range of our own curriculum. We have certainly come a long way in recognising that design intelligence is generic to all humans. We also all now agree that it is certain quite specific mental processes – including modelling and visualising – that make design possible, whatever the field. These are important broad concepts but ironically, their acceptance does not seem to be matched by a recognition of the scope of design in the real world. If we take these two diagrams – Areas in Design and Who Designs? – it is clear that Design and Technology comes nowhere near to covering the range. 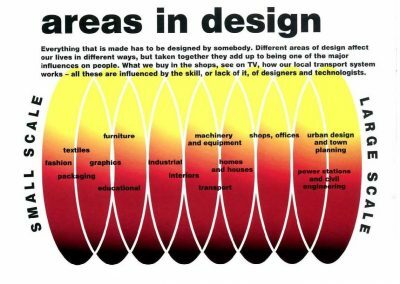 It very much comes near the centre, but there are socially and economically important areas of design at the two extremes. I would hazard a guess, that one part of the problem lies with Art and Design educators. In the late 1960s, Peter Green at Hornsey College of Art tried to bring art teachers kicking and screaming into the Twentieth Century. At the Teacher Training Department, graphics, fashion, filmmaking and industrial design were considered to be of equal educational importance with painting, sculpture and printmaking. This approach flourished for a while but it never became the norm. One of the most important areas of design activity is hardly recognised at all in general education. 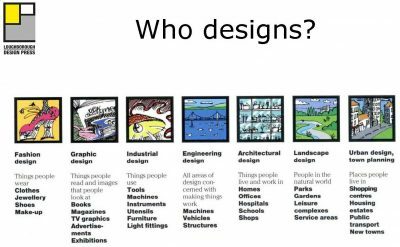 Planning and the built environment of places and buildings affects all our lives but it is totally missing from the design curriculum. Ironical, because the home is one of the few areas where every adult is, to some extent, the designer of their own lives. Is it missing because it is simply too hard to deal with in school? It might seem so, but there is solid evidence to the contrary. When, in the 1970s, I was head of the Design Education Unit at the Royal College of Art, we joined with the GLC’s Architects’ Department and the Inner London Education Authority, to see what contribution Art and Design teachers could make to teaching about the urban environment. The project was called Front Door. We worked with Pimlico School. Here we found Eileen Adams, one of the school’s team of art educators, and it was she who ensured the project caught fire. It launched Eileen on a period of highly innovative curriculum development work in which she conclusively demonstrated that art-based methods of study could be the key to learning about the built environment. It was Leonardo da Vinci who claimed that visual knowledge was the best kind of knowledge. Children and young people certainly found this was true in relation to the city streets, houses and flats where they lived. Eileen always saw her work as much more than ‘architectural appreciation’. She wanted to help prepare young people to play a more active role in shaping their own environment and the environment of the community. It was design education in the true sense. LDP is delighted to have published Eileen’s biographical account of her work in Britain and abroad. It covers a wide range of topics including the Campaign for Drawing and the Learning through Landscapes project. But at this moment of reflection on the future of the design curriculum, Eileen’s work is a reminder that we should be looking well beyond the present rather constrained horizons of the subject. We need to reflect the full scope of Who Designs? if we are to validate our claim to be essential to a modern curriculum.